Inverness assistant manager Brian Rice has urged the Highlanders to build up a head of steam that will carry them back into the top six next season. John Hughes’ men were disappointed to miss out on a place in the top half of the Ladbrokes Premiership despite beating Dundee United on Saturday. But Rice says Caley Thistle are now aiming to finish “best of the rest”. However, he is also wary of being sucked into the play-off fight between Hamilton and Kilmarnock. 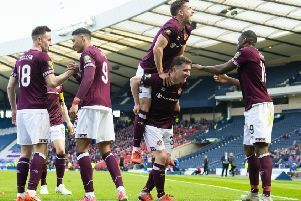 Inverness have a seven-point lead over 11th-placed Killie and a three-point cushion on Accies but can jump from ninth to seventh by beating Hearts at home in Tuesday’s re-arranged fixture. With six games to go, Rice would prefer to focus on a positive end to the campaign than worrying about a relegation scrap. He said: “Everybody wants to finish the season well. Look at Leicester last season. Look at how they finished their campaign and then carried it into this year. We want to do the same. “It’s disappointing not to make the top six but our aim now is to finish up being best of the rest. “It’s been a difficult season with all the injuries we’ve had and losing some players but with six important games to go, we want to win as many as we can. “I think everybody is always looking over their shoulder in football. You want to be looking ahead all the time but that’s not always possible.